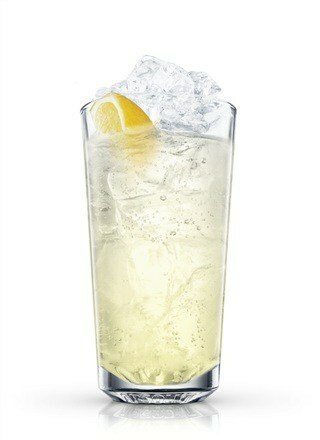 Stir all of the above together in the Tom Collins glass (see image above) and add 4 ice-cubes. Fill with soda water, stir again, and serve immediately. If you use Old Tom Gin (see below), use half the quantity of sugar syrup. 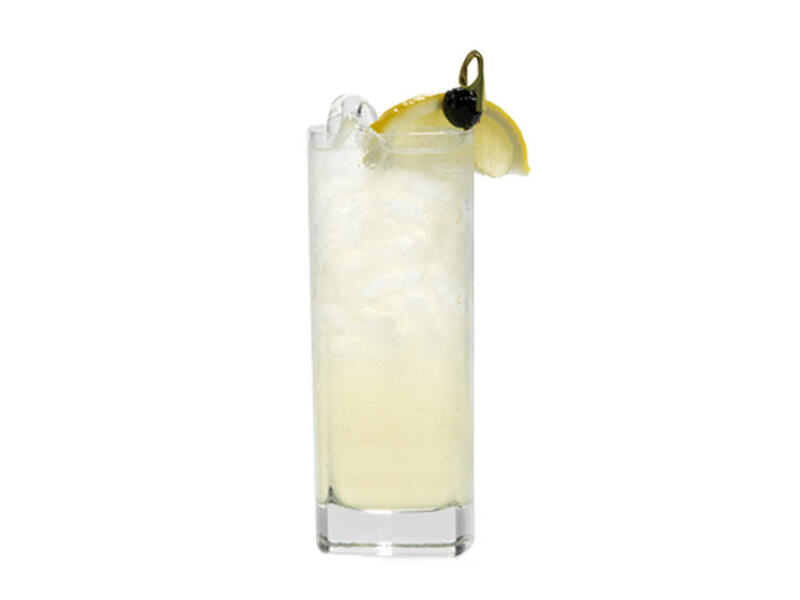 Originally a Tom Collins was made with Old Tom Gin which is a sweetened type of gin. Unfortunately it is not seen often these days so we have to substitute regular gin and sugar syrup1. 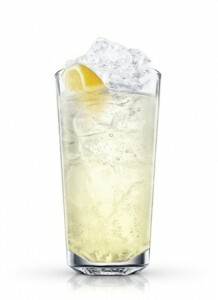 A collins is served in the tallest glass used for cocktails which is, appropriately, named a Tom Collins glass. It will normally hold 12-16 ounces. 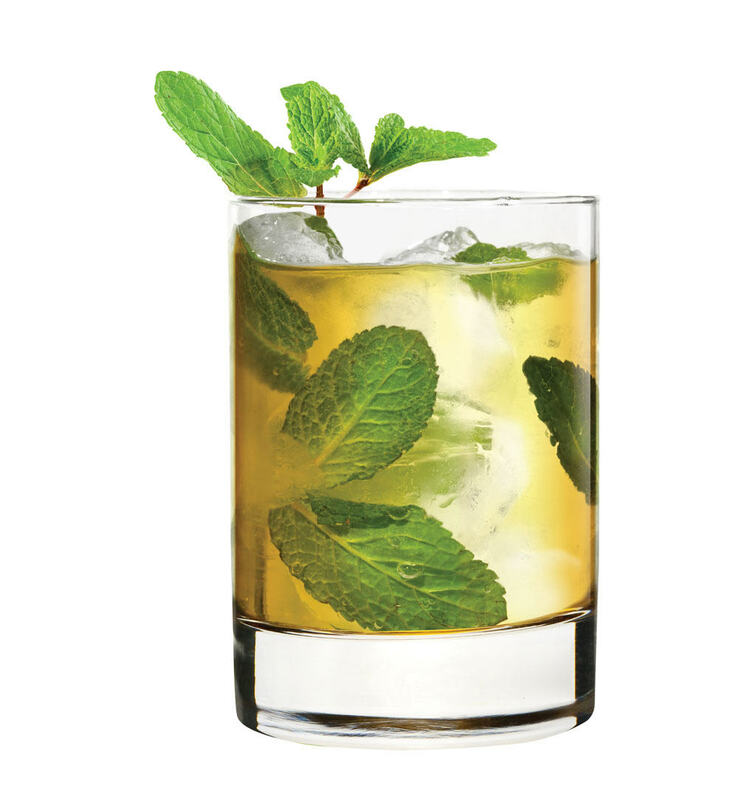 In a tall bar glass (this is not used for serving – just mixing) put 1 tablespoon of sugar syrup, a dozen young mint leaves, and 2 or 3 dashes of angostura bitters. Bruise the mint gently with a muddler and blend the whole mix by stirring and pressing slightly (do NOT use a blender). Do not crush the mint leaves or it will release bitter juices. Pour 2 ounces of Bourbon over the top. Remove julep glasses from the refrigerator and fill with crushed ice (being careful not to touch the glasses with your bare hands. Pour the julep over the top and stir for a few minutes. Add some more ice and top with enough Bourbon to fill the glass to 1/4 inch from the top. Insert two long straws and decorate with sugared mint leaves and serve. Everyone has their own take on the julep (particularly the mint julep) so it can be very controversial to present a recipe as the “best”. Nevertheless, I think after tasting you will agree with this one. Combine the ingredients in a goblet or highball glass. Fill the glass with chilled soda water. If you wish, you can omit the lemon juice, but I recommend keeping it. This is now ready to serve. The generic term sling refers to a drink made of sweetened spirits and water. You can substitute virtually any spirit for gin in this recipe to produce a whiskey sling, a rum sling, a brandy sling, etc. Put all three ingredients in to an old fashioned glass (an old fashioned glass is the type of glass you normally serve a whiskey on the rocks – “old fashioned” here does not mean antique,) with large cubes of ice. 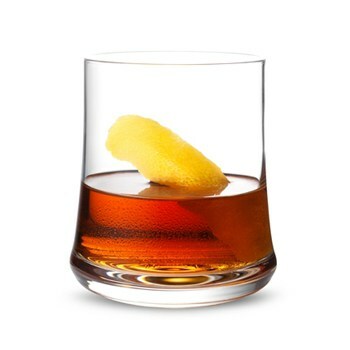 Drop a twist of orange peel (and optionally a cherry) on to the top and serve. NOTE: many people mistakenly think that grenadine is a raspberry liqueur – that is not correct. Grenadine is made from pomegranates and you should notsubstitute raspberry in this recipe. This recipe is for the “Cuban” El Presidente. 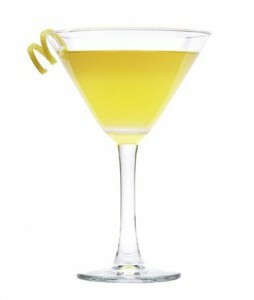 There is also an “American” El Presidente which includes lemon juice and curacao. Shake all of the above vigorously and strain in to chilled old fashioned or cocktail glasses. 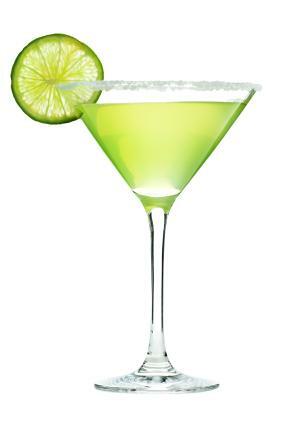 Interestingly, this drink was originally called a Bacardi, but the Bacardi company won a copyright suit so the name daiquiri has stuck. I have added the Sazerac mainly out of historical interest as it is one of the earliest (and in fact, may be the earliest cocktail known. Due to the combination of absinthe and whiskey, it is not to the liking of many people. Combine the above ingredients in a small old fashioned glass with crushed ice and stir to combine. Serve immediately. The origins of the Margarita are unknown. What is known is that it is not a drink that is meant to be blended in an electric blender and served like a slushy! 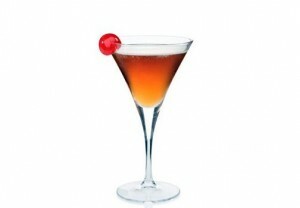 Shake the above ingredients over ice and strain in to a glass of your choice (see below). These are normally served in a sour or delmonico glass, but you can use a standard cocktail glass. This happens to be my favorite cocktails. The Manhattan is normally made with rye whiskey, but you can substitute bourbon if you prefer. 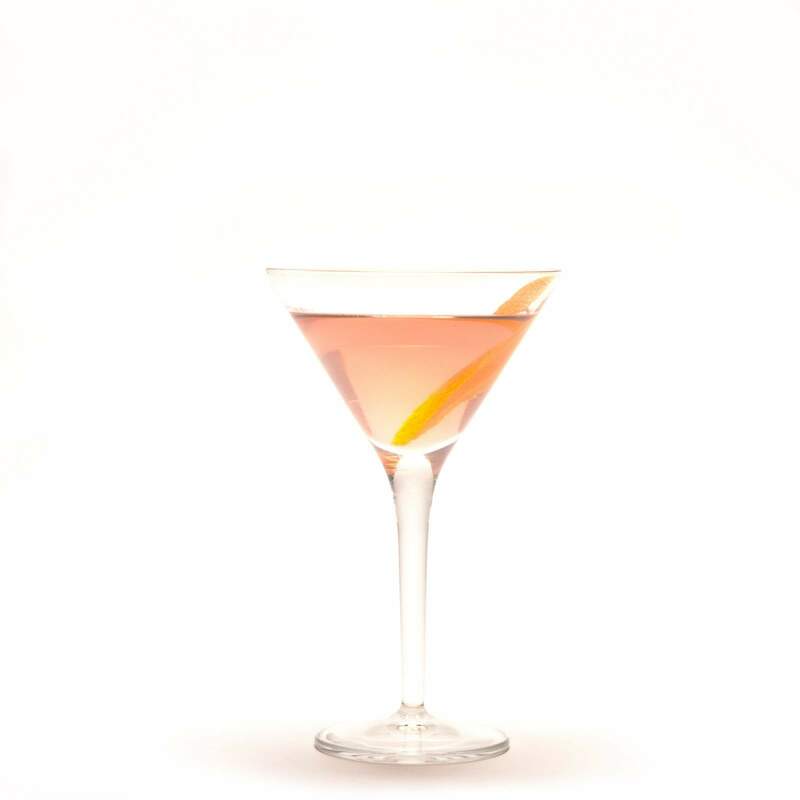 This is likely to be the most controversial cocktail on the list as the true martini has been greatly maligned in film and bars all around the world. First of all, let us just clarify a few points. A martini is made with gin. Always. 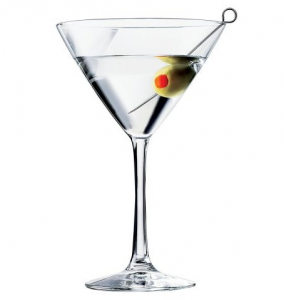 If you use vodka, it is not a “Martini” it is a “Vodka Martini” – only an ignorant person would ask for a martini and complain if it is not made from vodka. Using a twist of lemon instead of an olive in a Vodka Martini, gives you an entirely different drink which is called a Kangaroo. The second serious issue that needs clarification is that you never shake a Martini. James Bond is wrong – a Martini is always stirred. If you ask for a Martini shaken, you merely show your ignorance. The reason for this is that all white cocktail are stirred – shaking introduced bubbles, introduces too much water, and the shaken wine (vermouth) makes the final result murky. Incidentally, if you absolutely must have it shaken – it is not a Martini, it is a Bradford. Now, on to the recipe. This is the best Martini recipe you will find. Stir ingredients (don’t stir too vigorously) in a bar glass with ice. 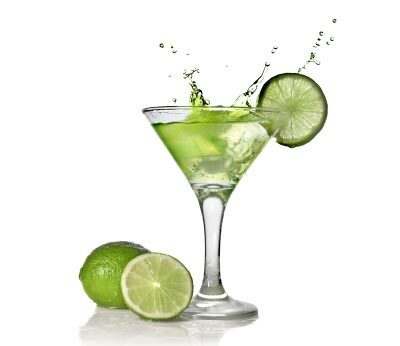 Strain in to a chilled cocktail glass and twist some lemon peel over the top (do not put the peel in the drink – just twist it to spray the top with the juices). Serve with one stuffed olive on a toothpick (for some reason it has become fashionable to serve a martini with 2, and sometimes even 3 olives. This changes the flavor of the drink and should not be done). If you use a cocktail onion instead of an olive, you have a Gibson rather than a Martini. * Sugar syrup can be made at home by combining equal parts of sugar and water and cooking until the sugar has completely dissolved. It is much easier to use this for cocktails as sugar can be difficult to dissolve in alcohol and you can up end up with grains in your cocktail. When using sugar syrup, you can substitute one for one.